Principal Lecturer in Screenwriting, Dr Craig Batty, teamed up with Sandra Cain, who graduated from BU with a BA (Hons) in Communication and Media in the late 90s. They wrote the book together over two years. We felt that there was a definite gap in the market for a book that catered for such a wide range of media writing forms. There are lots of form-specific books for journalism, PR and so on and a few that bring two or three forms together, but none that cover the range that we do. The book covers a wide range of writing styles, including print and broadcast journalism, public relations and media relations, advertising and copywriting and fictional and factual screenwriting. 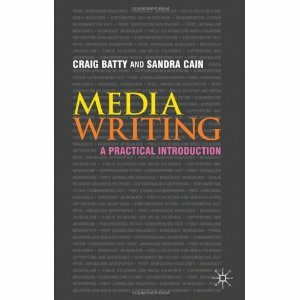 Craig and Sandra give useful case studies and examine the importance of digital technology in media writing, making this a must-have book for undergraduates studying any kind of writing. Craig and Sandra launch ‘Media Writing: A Practical Introduction’ on 6 October 2010 at Blackwell’s bookshop in Southampton. It is published by Palgrave Macmillan and is available now. 7th October 2013 Journalism: New Challenges, free eBook published by BU’s Journalism and Communications Research Group (JCRG).